﻿ Khmer Mansion Boutique Hotel, Siem Reap | FROM $45 - SAVE ON AGODA! "The service here is superb!!" 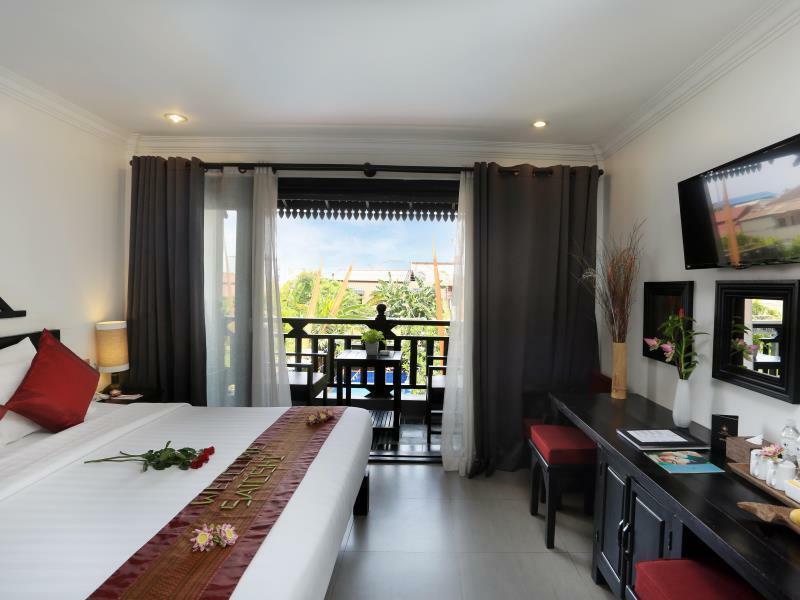 Have a question for Khmer Mansion Boutique Hotel? "Our comfort was their top concern." "The hotel was lovely and tucked right into the center of town without all the noise of the city right outside the window." "Cozy hotel with best staff service, nice location, will be back sooner!!!" 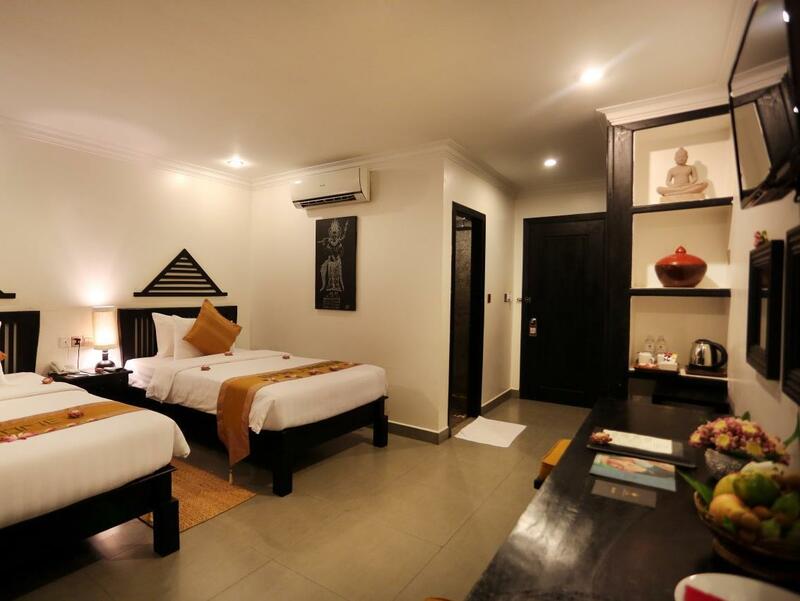 "Warm welcome by hotel staff at Siem Reap airport upon arriva..."
Nestled in the heart of Siem Reap Central Area, Khmer Mansion Boutique Hotel is an ideal spot from which to discover Siem Reap. From here, guests can enjoy easy access to all that the lively city has to offer. With its convenient location, the hotel offers easy access to the city's must-see destinations. At Khmer Mansion Boutique Hotel, every effort is made to make guests feel comfortable. To do so, the hotel provides the best in services and amenities. 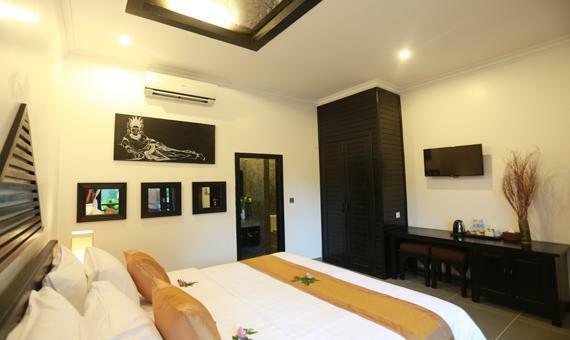 Free Wi-Fi in all rooms, 24-hour security, daily housekeeping, taxi service, ticket service are just a few of the facilities that set Khmer Mansion Boutique Hotel apart from other hotels in the city. Guests can choose from 22 rooms, all of which exude an atmosphere of total peace and harmony. The hotel offers many unique recreational opportunities such as outdoor pool, spa, massage, garden. 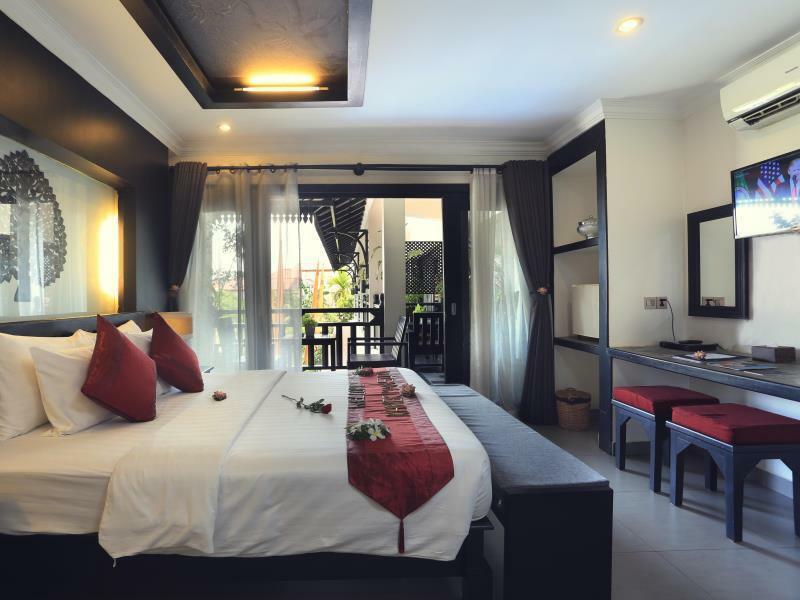 Discover an engaging blend of professional service and a wide array of features at Khmer Mansion Boutique Hotel. "Nice rooms, nice pool, excellent staff." Have been here many times and keep coming back several times a year. Hotel is well run, pool area beautiful, rooms nice and clean. Staff is amazingly friendly! The location is near village and night life so some music can be heard but at least that is not problem for me. See you soon again! The staff was wonderful all through our stay. Good breakfast. Nice swimming pool. Very near restaurants and bars in Pub Street. Nice room room with balcony, but a lot of mosquitoes outside. Had difficulties with phone charging in the room. The light for the mirrors were bad, so difficult to make up your face. Adventage : Friendly and helpful staff, excellent location, clean room condition. Disadventage : little bit noisy until midnight because of pub street people. If I will go to Ankor wart again ( I must do ), I will stay this hotel again! Stayed here for 4 nights with two young children. The staff were friendly and very accommodating. As it was mozzie season, the rooms are sprayed with insecticide when we were out, that really helped a lot. The kids loved the pool and had a great time there. Breakfast was also good by Cambodian standards. Khmer mansion is the place to be in Siem Reap. Location is excellent and the staff is super! Rooms are nice and everything just works. Pool area is beautiful and restaurant serves good food. What else can you ask? Our 3rd time staying at this hotel which is just a few steps away to Pub Street and Night Market. Staff are friendly and greets you with cold towel & water each time you return to hotel from shopping/sight-seeing! There's a small pool for relaxation but no gym in this hotel. Good location，warmest service and kind staffs. Can’t say enough nice things about this place. Clean, comfortable, nice room, great location. Best part of all was the staff and how much they cared about making sure you had a great stay. The service here is superb!! From the free transfer service to the concierge service and their friendliness. They helped us book tickets to Phare Circus and an Apsara show without extra charge. They helped us arrange tours to see the temple (short circuit and long circuit, avg ~$80 each) with guide and car at reasonable price. I’d recommend splurging for car to avoid the heat and dusty smelly roads. Treat yourself. Shame we weren’t able to use the pool. Location is very close 5 min walk to pub street and night market and restaurants and bars and massage places. Heard some music pumping into the night probably from a nightclub but it didn’t disturb our sleep. All the staff was amazing but we’d like to thank especially August and Nara. Excellent service. Location is great within 2 min walk to pub street. Not much privacy as the balcony is side by side to the next room’s balcony. Lots of fierce mosquitoes at the balcony! Room is clean, bed very comfortable. Toilet has some hard water stains on the floor due to the concrete finishing. At nite can hear music till very late, it is not recommended if you are a light sleeper. Breakfast is not bad (individual plated, not buffet) but need to wait for them to prepare which we noticed many people are getting impatient as everyone has to rush for an early tour trip / airport. I would suggest the hotel to provide a buffet table so it’s easier for them to handle instead. The staffs provide excellent service which is great. Free transfer both way to airport and they gave us each a cute scarf when we leave. Thank you! We loved the 3 nights we stayed at the Khymer Mansion Hotel. From the moment you arrive the staff are helpful and friendly and become like friends after just a few days. The room is small but fine as is the bathroom. The pool is terrific and so refreshing. Breakfast is ordered and plenty of choice. The hotel surprised my husband with a birthday cake and decorations in the room. 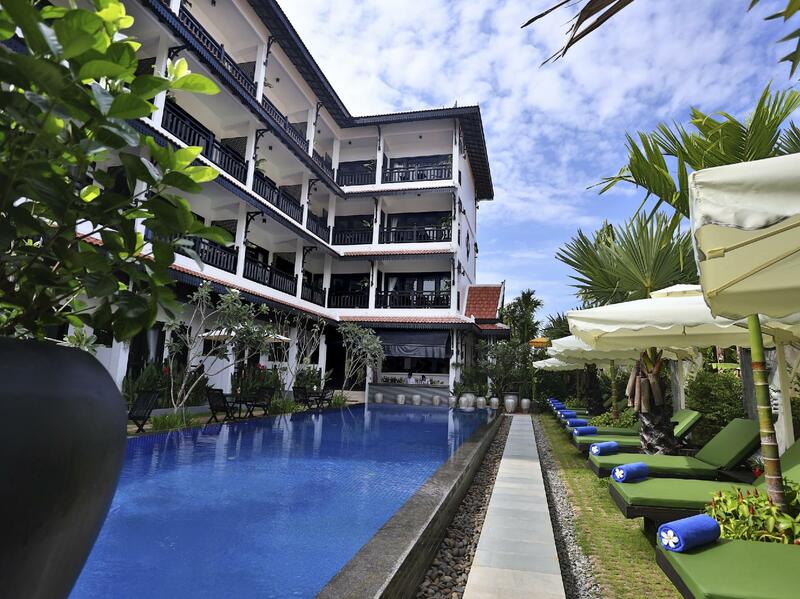 It is a really lovely hotel and we will stay there next time we visit Siem Reap. Stayed for 4 nights and never got disappointed in choosing this property. The service is impeccable and consistent! I love each day we stayed and we will definitely recommend and stay again. Thank you for the warm and superb hospitality. The 3-day stay in Khmer boutique was really impressive with it’s 6 star service. I would definitely recommend it to my friends. Kert, I even remembered his name, was so nice and considerate, I like him very much! I was impressed by the hotel service. Free aiport trasfer service, dilicious meal, a fancy and clean room, nice location near the pub street, free storing luggage, and gifts after check-out made me amazed. All the staffs spoke english well. I was sorry for not taking part in the evening barbecue party. 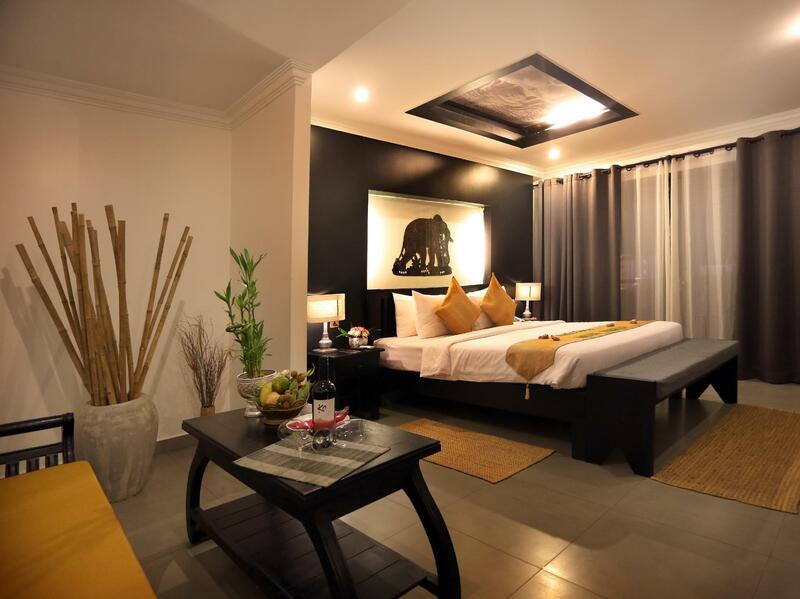 If i have a chace to trip to siem reap again, i will use this hotel. Through your serives, i am thinking all the cambodian are kind. I would like to recommend this hotel to other people. I have been here many times and keep coming back. Nice boutique hotel with excellent service. I mean 100% perfect. You cant compare with any other hotel in the area. Rooms are nice and well maintained. Pool area is beautiful and well taken care. Big plus is that they have enough sun beds. But still one more time, the service is absolutely perfect! The hotel staff were very kind. the location is the best. which is close to Pub street, old market to enjoy nighttime during your stay . breakfast is so so but not bad. I d like to introduce the wonderful hotel to my friends. from Korea.